Do you have any trial classes scheduled? Occasionally we offer pop up classes for families to try out a single class with no commitment. 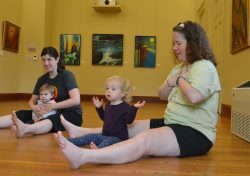 Those tend to happen at the end of a term, but Baby Yoga & Play is scheduled for semi-monthly weekend pop up classes and Family Yoga (ages 4+) is sometimes offered in that format! Get on our newsletter list to be notified when pop ups are scheduled.